Dissolve jaggery in boiling water and cook it until it is reduced to half and then strain it. Roast green gram till it turns golden brown and powder like semolina. Roast the coconut till it turns golden brown. Mix both coconut and green gram mixtures. Boil jaggery syrup until it is of the consistency of honey. To this add the above mixture and mix well. Add cardamom powder to it. In a separate bowl, mix together rice powder, turmeric powder and salt along with required amount of water. 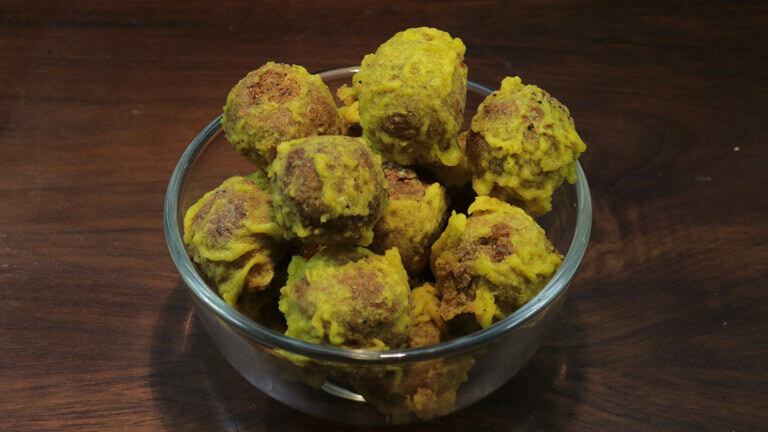 Make small balls of green gram mixture and dip it in the rice powder batter. Fry them in oil. Tasty mundiri kothu is ready.